No matter how old we get, we all want to have the chance to live our lives without having to depend on others. But unfortunately, this is not always possible. Sometimes, one’s freedom gets restricted due to some medical condition that limits the movements. This is however where mobility aids and equipment come into play to literally save the day. From all of the mobility aids and equipment available, mobility scooters have become the most popular ones lately and for a good reason too. Thanks to their improved design and decrease in usage stigma, mobility scooters are becoming more and more common sights on many streets and are widely available for purchase in stores that specialise in mobility aids and equipment. However, despite their prevalence, many people still don’t know the real benefits that these devices can bring to their lives. A mobility device can help you get your independence back, enabling you to do get putside your home and get some fresh air, do some chores or even get to work. Keeping your independence helps combat depression, which is a common issue people with a physical disability have to deal with. 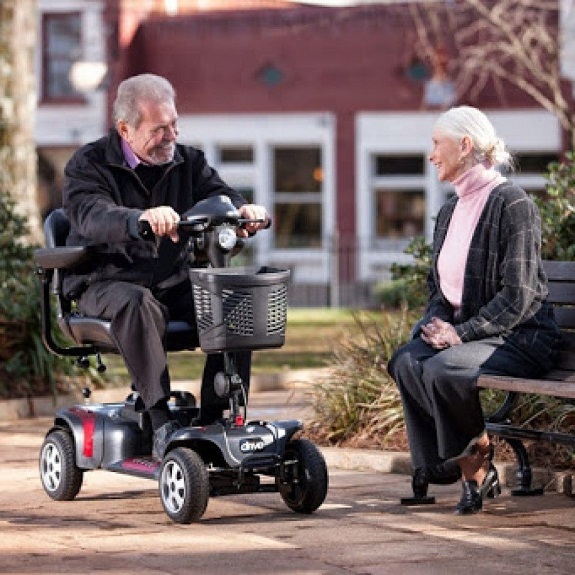 A mobility scooter can help make it much easier to leave the house and continue spending time with others. Unlike wheelchairs, mobility scooters come with a seat that can swivel. This means you won’t have to crane your neck or be forced to turn the entire device to look behind you. Mobility scooters also offer much more space for the legs and are much less cramped than a wheelchair. And considering the fact that a mobility scooter can fold up too, it also helps saves space and ensure easy transportation. When compared to crutches or manual wheelchairs, a mobility scooter is much easier on the upper body. They don’t strain the shoulders or cause pain in the arms and the padded seat is upright, which helps support the user’s back. Going up inclines is also a lot easier with this device and there’s no risk of losing control and rolling backwards as it is the case with a wheelchair. There’s also no risk of falling, which would be the case when using a cane or crutches. You are also able to travel much longer distances with a mobility scooter. A mobility scooter can go six to twelve kilometres per hour, helping you save time and energy to get to your destination. This way, you’ll be able to keep up with your friends cafes or restaurant without wearing yourself out. Don’t let your physical disability impact the quality of your life. Get a mobility scooter to regain your freedom and move around without anyone’s help.